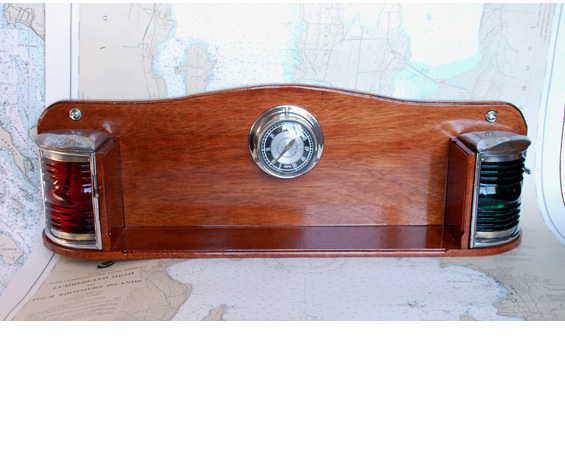 This solid mahogany shelf was designed and constructed to display these vintage running lights and original speedometer that was salvaged off of a 39', 1961 Chris Craft "Connie". The running lights are solid brass that were chrome plated. The lights are not currently "wired" but this could be easily accomplished should the new owner wish to do so (the original electrical sockets are still installed). 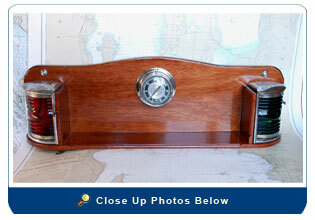 Size: The shelf is 26 ½” long, 7 ½” high and 4 ½” deep. The light’s face is about 4” and the speedometer face has about 3 ¼” diameter.